Natasha Scott and I just finished leading our annual SOYA 200hr Immersion Yoga Teacher Training program in the Okanagan. I always joke with students at the beginning of the training that they might have thought they were coming to get certified to teach yoga but the Immersion training is actually a personal growth course disguised as a yoga teacher training. When I look around the room on the first day of training, I usually see eyes filled with doubt, fear and excitement. Their eyes have usually been opened while completing philosophy and anatomy lessons for several weeks prior to arriving to the residential 16 days training. Participants sleep, eat and breathe yoga from 7:30am-7:30pm, and a transformation happens that is nothing short of magical. These are some of the insights I’ve had through the great honour of ushering in new yoga teachers over the past 6 years. 1. Anchor before you speak. Speak from a place that’s authentically and intelligently you but humbled by the fact that you are a compilation of all the incredible teachers you’ve had so far with the magic fairy dust of Grace sprinkled on top. We are all there to be a clear and open channels so that the wisdom of yoga can be conveyed and received to the best of our ability. Speak from a place of service. 2. You will need to get skilled in holding space for awkwardness, tears, anger, extreme appreciation, confrontation and mushy loveliness- yours or others. How do you get skilled? Through the dedication of your own practice. Can you be present with your own emotions? Can you bear witness to Life’s intensities without reacting? If our interest as yogis are in self inquiry and self-compassion, the work has to start on our own mats in the jungle of our own minds. 3. Your level of self-care is proportional to the level of service you can provide to your students/fellow trainees. Early on in trainings I noticed that when the quality of my own or student’s sleep or nutrition was compromised, there’s no energy to do either of the points above. Prana (life force energy) in the body is best supported through clean nutrition, rest and doing your practice and own inner work. The quality of your output is completely dependent on the quality of your input. 4. The pull towards your fullest self is stronger than fear. Trainees often arrive and admit to feeling vulnerable, like they don’t belong, uncertain of their choice to be there or of their ability to lead a class. Yet, they show up. Not only do they show up but they recommit every day to a strong workload and long hours. We all have the voices that don’t like change, the voices that can keep us from growing. This sense of separateness (I don’t belong here) holds us back but the underlying longing to maximize our personal potential is so much more powerful. Sometimes it needs fertilized and watered (that’s our jobs as yoga teachers) but it’s always there. 5. The value of community. For your sanity, seek out like-minded people to bounce ideas off of, to answer questions, to guide and help you grow, to call you on miss-steps and to honour, reflect and celebrate paths you walk down. If yoga is a huge part of you, it’s important to have people in your life who you can talk chakras and 8 limbs with and share the revelations that this kind of transformational practice can spark. Teacher training or your yoga studio /community often provide this kind of arena where very fundamental layers of you can be seen and shared. If a 200hr or 300hr upgrade teacher training is for you next year, visit SOYA for the full listings of trainings in BC, AB & Mexico. Early on a Sunday morning in September 2009, I arrived at Chinook Yoga in Prince George to tell Carla and Cindy I had decided to not enroll in SOYA’s 500 hour yoga training program. I had several reasons why: I had 2 small children at home, money was tight, I wasn’t a good enough yogi, but mostly, I was scared. At some point during my 500 hour training, I became very interested in yoga nidra – and who doesn’t love a super long Savasana? Every student in the advanced training must research a topic and write specialty project about it… maybe this would be my topic! I attended a workshop in Vancouver, further cementing my interest in this ancient meditative technique. In the past two years because of some health issues, I’ve been forced to take a step back from the asana limb of yoga. I’ve enjoyed this opportunity to explore meditation and experiment with a daily practice. Last winter, while feeling “stuck”, I had a conversation with my sister and sister-in-law. With their support, along with that of my husband and kids, I decided to follow my dream and pursue further training in yoga nidra. Among the books I’ll be reading are Patanjali’s Sutras – my favourite from my SOYA training. The SOYA training prepares its graduates for so much more than asana! It creates a solid foundation for all the deeper studies you may wish to embark on! In conclusion, why am I writing this? I guess it’s to acknowledge my journey… our journey… the wonderful people I’ve met along the way and their generosity of spirit. None of this would have come to pass had I not allowed myself to be embraced by the yogis in that room at the SOYA teacher training in Chinook Yoga Studio, back in 2009. So, thank you, friends and fellow yogis, Mugs and SOYA, for igniting that spark in me and for keeping it lit along the way. I’ve been so blessed and I am forever grateful. Namaste. One of the many things I look forward to is an early morning meditation on the yoga platform at God’s Mountain Estate. 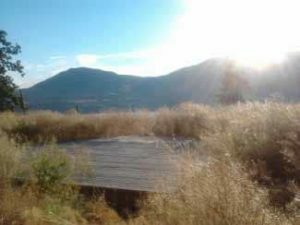 There is this beautiful deck that has been built in this wild field overlooking Skaha Lake. Often when I arrive on this platform I feel like I could sit here forever and meditate on the vast beauty of what is. Surrounded by the birds, the deer, mountain sheep, the sky, the warm breeze, trees and the lake, it takes me to that quiet still place within, so quickly. Slow down your breath. Become aware of your senses. Feel the temperature of the air on your skin. Feel any breeze. Become aware of any sounds you can hear, whether they be way up high in the sky or right beside you. Become aware of any scents in the air, such as the cedar of the deck or something being carried by the wind. Be aware of any tastes that you have in your mouth. Take a moment to watch the back of your eyelids, becoming aware of any shapes that appear. Spend some time here. Connect to a softer and longer breath. Once you have connected to a softer and longer breath, start to watch the breath, like a parking lot attendant watching cars go in and out. Watch the breath come and go. Spend some time here. Settle in for a while. If you find that your mind starts to wander (and that’s what minds do!! ), just notice. That is the key. Notice and bring you mind either back to the senses or back to your breath. After about 30 minutes of meditation you may start to take deeper inhalations and exhalations. Slowly start to open your eyes. Pause here as your heart is refueled. Take in the beauty, become aware of the vividness of colors; aware of how beautiful this feels. The meditation platform at God’s Mountain Estate inspired me to offer a retreat there next summer. There will be morning meditations on the yoga platform from 6:30-7 am, and a few evening ones too. I can’t wait to sit with like-minded students and refuel ourselves at the Samadhi station on the yoga platform at God’s Mountain. At God’s Mountain the food is locally grown and prepared with love. The rooms are unique and cozy. I hope you will join me for adventures, the beach, acupuncture and yoga! Just like our meditation. We may travel far away looking for peace, stillness, and knowing. But the truth is, it is always inside of us – we just need to come home to the heart. This retreat is in honoring of reconnecting with home. I hope to see you here next summer, in this paradise I call home. A Review of DVDs created by Neil Pearson and Shelly Prosko, written by Mugs McConnell, ERYT500. Yoga is becoming more and more recognized as a way for those suffering from chronic pain to regain some range of motion through gentle movement. Neil Pearson is one of the leading experts in yoga for chronic pain. He and Shelly Prosko, both physical therapists and yoga therapists, have created a series of videos on gentle yoga practices for those coping with chronic pain. It is so important to move the body even a little. In this series, Neil and Shelly demonstrate how to modify the yoga poses within each sequence to fit the degree of movement possible depending on one’s level of pain at any given time. Because we are all unique, there is no “one size fits all” practice or sequence for those dealing with pain, but the concepts in this series can be translated into any asana practice for each individual. Each pose is adapted to be done either sitting on a chair, standing, or lying on the mat. The student is guided with encouragement and sensitivity to bring awareness to the sensations in the body, without judgment, from a calm, centered place. Everything is focused on relaxing into the pose while observing its effects. Meditation and breathing are key to bringing one to a place of awareness and inner quiet. I like the focus on right and left nostril breathing, which brings balance to the yin and the yang, the opposing energies with in us. The yin aspect relates to the left nostril and helps us to removes judgment and stay within our level of comfort. The yang aspects relates to the right nostril and gives us the energy to try. These practices bring awareness to both. If your level of pain has brought you to a fearful place when you exercise or attempt to regain movement in your body, I highly recommend you try this series with Neil and Shelly. Each class takes you through a meditation, breathing technique, asana and relaxation. You can rent the videos one at a time from vimeo.com or buy the entire series of 7 videos. Level 1 is also available on Vimeo. If you want to learn how to overcome your pain with gentle yoga, these two are experts in the field and are doing their best to get you pain free. Mugs McConnell, ERYT500, is a founder of the SOYA Yoga Teacher Training program. 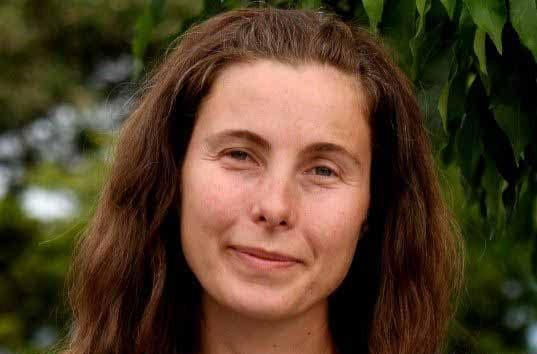 She is the Canadian Representative for the International Yoga Teachers Association (IYTA) and a member of the Yoga Alliance Board of Directors.